The IRS changed instructions for claiming exemptions form withholding. Now you must indicate that for both 2017 and current year 2018 you had or expect no tax liability. The IRS releases its withholding calculator. 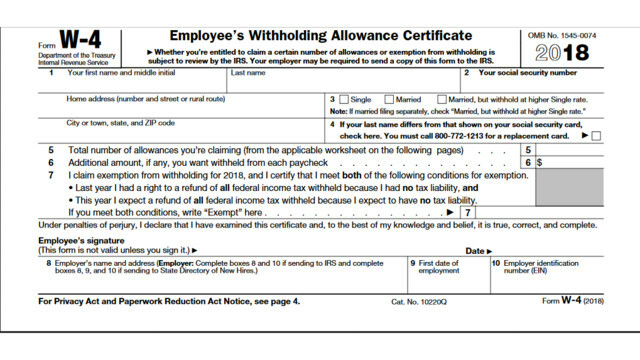 the W-4 instructions state that if you use the withholding calculator, you don’t need to complete any of the worksheets for Form W-4. This was not stated on the previous W-4. It may indicate that the withholding calculator is the most reliable method to get your withholding closest to your tax liability. Removed the reference to dependents whom you can claim on your tax return. Changed the calculation for the child tax credit to reflect the new amount and the significant increase in the phase-out amounts. Added the credit for non-child dependents to factor into allowances. The estimate of itemized deductions to reflect the new tax law referencing the $10,000 cap on state and local taxes (including property and income taxes) and the change to medical expenses in excess of 7.5 percent. The wage thresholds and amounts for the Two-Earners/Multiple Jobs Worksheet to reflect the dynamic of the new tax code on these taxpayers. If you have any questions on how to figure your W-4 please give Bourke Accounting a call at 502-451-8773 or stop by for a visit. See you soon!